iofast's Cat5E molded patch cables are made with high quality 24AWG 100% pure stranded copper cores. We do not use the cheaper CCA or thinner gauge wiring that some inexpensive manufacturers use. The plugs found on both ends of our cables feature 50µm (micron) gold plated terminals as opposed to 3µm or 6µm "flash" gold plating found on lower grade connectors. Our cables have also been tested at 350MHz, 3.5x the 100MHz rating required for Cat5E. Each cable also features an injection molded snagless boot to help protect the connector's clip. These features make our high-quality, high-value cables ideal for wiring PCs and other devices to both home and corporate networks. All of our Category 5E cables fully support both 100BASE-TX Fast Ethernet (100Mbps) and 1000BASE-T Gigabit Ethernet (1Gbps) at their maximum operating distance of 100 meters. For more information, please take a moment and look at the FAQ tab where you can learn about why our patch cables are such an exceptional value. Supports 802.3u Fast Ethernet 100BASE-TX 100Mbps (12.5MB/s) @ 100 meter maximum operating distance. Supports 802.3ab Gigabit Ethernet 1000BASE-T 1Gbps (125MB/s) @ 100 meter maximum operating distance. What is CCA? Do your cables use CCA? CCA stands for Copper Clad Aluminum. It uses an aluminum wire as it's base that is then coated with copper. It less expensive than pure copper wiring and can be found in many low cost cables. CCA is not permitted by TIA-568-C.2, UL Code 444, the IEC or the CENELEC. Furthermore 3P, a third party industry standards testing organization, strongly advises against the use of CCA wire in any twisted pair network. Pure copper cables have lower attenuation than CCA cables and provide a more stable connection with less packets being lossed on the physical layer. As wire length increases this affect compounds and will lead to slower networks when long cable runs are required. Finally, CCA wires have a lower tensile strength than that of pure copper allowing them to be damaged more easily during installation and use than a pure copper cable would. Gigabit over Cat5E? I thought that required Cat6, are you sure? There is a common misconception that Category 6 is required for Gigabit Ethernet that was propagated by some early Category 6 manufacturers in hopes that the 1000BASE-TX Standard would become the dominant Gigabit Ethernet standard. At that time their were two competing standard: 1000BASE-T and 1000BASE-TX. 1000BASE-TX Gigabit Ethernet was designed similar to that of 100BASE-TX Fast Ethernet and only used 2 wire pairs (4 wires) to provide Gigabit Ethernet speeds. This however would require upgrading existing wiring to Category 6 to be achieved. The alternative standard, the one which was widely adopted and took over the market, was 1000BASE-T. This implementation was designed to use all 4 pairs (8 wires) inside of existing Cat5E cables to allow for Gigabit Performance over the wiring that had already been done for 100BASE-TX Fast Ethernet. The one down side to this was that it was no longer possible to run analog voice (phone) and data over the same lines as had been done in the past. However with digital voice service becoming prevalent and the cost savings offered by reusing existing wiring the 1000BASE-TX standard never gained traction. What do you mean by 50µm (micron) gold plating? 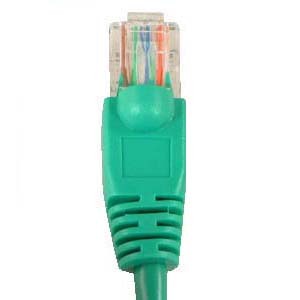 The contact point of RJ45 plug, where the rubber meets the road if you will, used for Ethernet patch cables is gold plated to maintain optimum conductivity with the RJ45 jack it is connected to. There are several levels of gold plating thickness available in the market. The lowest grade typically found on budget cables is referred to by some as “flash” gold, and the thickness is typically between 3µm to 6µm. The highest grade available is typically 50 micron. The most notable difference performance wise between these various levels of thickness is with respect to aging. The contacts of both RJ45 plugs and jacks are exposed to moisture in the air that causes corrosion on their metal surfaces. Gold is well known to be not only highly conductive but also as a non-corrosive material. The thicker gold plating the better protection the contact material has from corrosion and thus keeps the Ethernet connection stable speed for many years. Furthermore when patch cables are used in high humidity or not-clean air environments, 50 micron gold plated plugs and jacks should be used. This page was generated on Thursday the 25th of April 2019 at 8:50:11 PM EST.